Flower stencils are being used by many DIY decorators that have no more artistic ability than..well.. me, to give the walls of their baby's nursery and bedrooms a unique look. Since the artist has full creative control over color choice, the results are their own original design even if they used free printable stencil patterns for the project. Those with some experience in painting murals or scenery on the walls often paint the background images of a flower garden or pastoral scene and then use flower stencils to fill in the finer details. Even artists with advanced skills recommend the use of stenciling as a timesaver and a means of getting consistent results from one blossom to the next. Check the list of resources below to find free simple rose stencil patterns that you can use to paint or print a silhouette of a long-stem rose. These printable outlines are lovely when framed and hung on the wall of a vintage rose baby nursery. To cover the walls of a shabby chic room with wild roses or old-fashioned cabbage roses, a layered stencil with more details will give better results. Go here to see more stencil sheets and books that can be used to decorate the nursery walls, furniture or floors. The petals of a daisy are so clean and uncomplicated that even if you have never made your own stencil pattern you can easily create a daisy wall stencil that works. This template is one of the easiest to make and use. Stencil using white and yellow for a rustic, country look or use bright colors to jazz things up and convert your original flower stencil into a Gerber daisy stencil. Other flower stencils that are very popular are foxgloves, tulips and elegant calla lily patterns but there’s no reason for you to resist the temptation to transform any rare flower into a stencil pattern. If you use for favorite orchid or state flower to design an original pattern, please drop by and share your floral baby nursery wall painting ideas with us. We would love to see what you’ve done using your very own flower stencils! 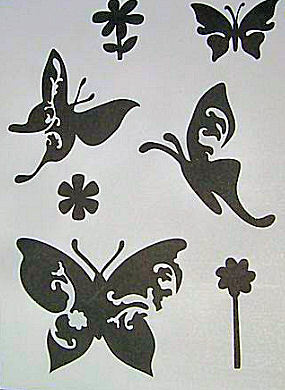 Here are some resources for free flower stencil patterns that have been suggested by visitors. If you use one, please consider sharing pictures of your wall painting project and let us know whether or not the template was one that you would recommend to others or if it was less than satisfactory. Go here for a free printable daisy stencil border template, a daffodil stencil and a flower pot if you have need of one. There is a wheat stalk stencil on the stencil pattern page that is actually nicer than any of the flowers. Go here to download a free printable Calla Lilies Stencil and a Long Stem Rose Stencil that is workable in many applications but the tulips stencil as well as the aster and other floral stencil patterns are actually silhouettes with little (actually no) detail. Go here to see a very nice assortment of downloadable, printable flower stencils as well as vine stencil patterns, leaves and bows to pretty up a dainty floral bouquet. This resource for free floral stencil patterns almost didn't make the cut because of all the hoops I had to jump through to get to the page. I actually had to give an email address and join a mailing list!